It is white grape juice that has been reduced and fermented through aging. Does it taste the same as other vinegars? Vinegars like wine, malt, and cider are made using different ingredients and methods. Their flavors and preferred uses also differ. Are all balsamic vinegars created equal? There are three grades: traditional, condiment, and commercial. Traditional (balsamico tradizionale) will taste sweet, sour, and woody, have a syrup-like texture, and be a rich dark brown. Commercial grade (aceto balsamico) is a mass produced modern version of the traditional. Condiment grade (condimento balsamico, salsa balsamica, or di mosto cotto) is often a combination of traditional and commercial. The lesser the quality, the more apt a balsamic vinegar is to be runny and more tart than sweet. Traditional balsamic vinegar is made from a reduction of trebbiano grapes. It is aged for a minimum of 12 years in seven barrels of successively smaller sizes in different woods: chestnut, acacia, cherry, oak, mulberry, ash, and juniper. The other grades may be made with varying proportions of grape juice and wine vinegar without aging and contain additives for coloring, flavor, and thickening. 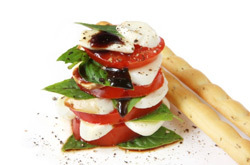 Balsamic vinegar originated in Modena and Reggio Emilia in Italy 900 years ago. But vinegar has been used for 10,000 years. How much should one spend when buying? That depends on taste and budget. Traditional balsamic vinegar that's been aged 25 years can cost from $25 to $400, depending on the company and the quality. Commercial and condiment grades run from a few dollars on up. It takes a minimum of 12 years to make balsamic vinegar using the time honored methods. What do those leaves on the label mean? Those leaves (1 to 4) are a ranking system created by the Italian Association of Tasters for Balsamic Vinegar of Modena, whose goal is to inform the consumer about what they’re purchasing. Not all brands and lines have been taste-tested. How does one know what they’re buying? Unless a bottle of traditional balsamic vinegar is made by either Modena or Reggio Emilia, and thus certified, there isn’t a guarantee on quality. Modena designates age with a cream cap for at least 12 years and a gold cap for at least 25 years. Reggio Emilia uses colored seals: red for the minimum 12 years, silver for at least 18 years, and gold for 25 years or more. Both of their labels for the traditional line bear "Aceto Balsamico Tradizionale". Otherwise, taste-test and see what others say about brands and their lines. Where can one buy the good stuff? Specialty stores will usually carry a few options. One can also purchase through Williams-Sonoma, Dean & DeLuca, and other stores online. What are some ways to use balsamic vinegar? Young vinegar (da insalata), which is aged up to 5 years, is usually used for dressings, dipping sauces, and marinades. For use in sauces, pastas, or braises, a medium-bodied middle-aged (medio-corpo) balsamic vinegar works well. 12 year old vinegar is best used in the cooking phase and on vegetables and fresh fruit. As finishing touches for hot dishes, meat, and mild cheeses, very old vinegar (extra-vecchio or il patriarca) aged 25 to over 100 years is recommended.